The heart has been a universal symbol of love, kinship, and affection since the thirteenth or fourteenth century. The symbol, vaguely reminiscent of a human heart or an upside down fig leaf, first appeared in European manuscripts associated with writings about love and romance sometime in the fifteenth. The earliest versions of the heart symbol looked a bit more like a pine cone than the geometric shape we recognize today. Heart shapes not representing love were drawn but as fig leaves and representing a handful of different seeds of a similar shape. Over time the two renderings merged and our modern heart emerged. A less pine-cone like version first appeared on playing cards in the Tudor era of the fifteenth century. By the nineteenth century, the scalloped heart, oriented point down, was widely associated with love and romance. It appeared on Valentine’s cards and jewelry alike. Today, we instantly think of love when we see a heart. Social media and digital communication have made it a constant part of our life, allowing us to “love” posts, texts, and pictures. There is no better way to show your significant other how much you love them than by gifting them with a piece of heart-shaped jewelry. 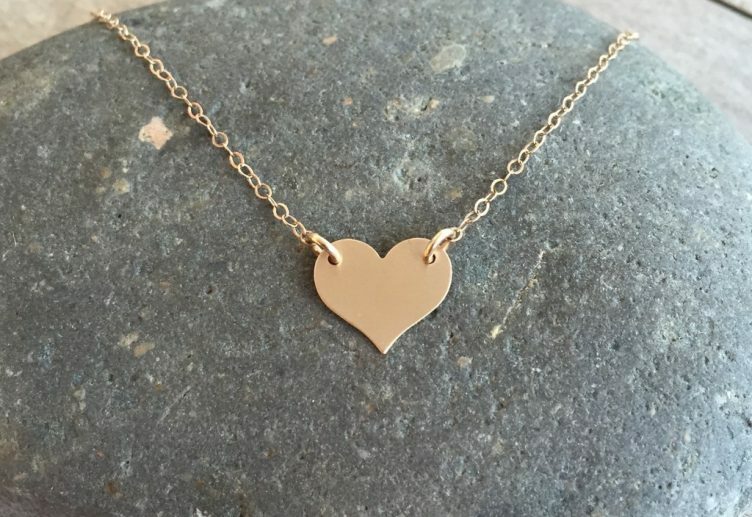 These are our top ten pics of gold hearts perfect for your anniversary gift! We will start with what started it all, an anatomically correct heart. We love the level of detail that has been put into this bargain price piece. Made by Ztuo, the charm is a three dimensional that heart highlights several important portions of a real human heart. Valves and the network of blood vessels are prominent as well as textural details on the right atrium and the pericardium. While this piece is not technically gold, it is surgical grade stainless steel, it is gold colored. Stainless steel may not be as valuable as gold or sterling but it is hypoallergenic and much harder to tarnish. It might be observed that the geometric shape we call a heart bears little resemblance to its real life counterpart. The shift from the human heart to scallop topped figure has been a long one. As mentioned above, initial representations of a heart looked more like a somewhat squashed pinecone. This was likely because of poor drawings and an even poorer understanding of human anatomy in medieval times. For the anatomical heart necklace, only the anterior side, or front side, of the heart is shown in relief. The back side of the charm is flat so it will lay flush against the wearer. This necklace includes an eighteen-inch gold colored chain but we recommend using an extender or swapping the charm to a longer twenty-inch chain. While the charm is on the dainty side at 17 millimeters by 12 millimeters, we love the idea of giving your loved one an accurate heart to wear over their heart. This necklace is also fantastic for including in a layered look. Pair it with chains of the varied shades of gold for a very fashion forward look. 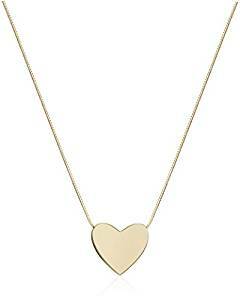 To make a theme collection, wear this necklace with other gold heart pendant or beads. It would also look great underneath a choker length cameo for a very macabre Victorian feel. This necklace is also great for men or women! To transition smoothly to the heart shape we expect when we think of love, next on our list of anniversary ready necklaces is the lifeline pulse heart necklace. 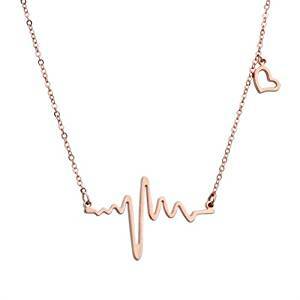 This 18k rose gold necklace features a visualization of a heartbeat, called a cardiogram, and a charming heart pendant on the asymmetrical axis. The sweet little heart is the perfect detail to complete this charming piece. And we love that this is in rose gold. We truly hope this is a trend that will never end. The cardiogram is a great tie from the scientific, anatomical heart to the symbol we know and love. A cardiogram is a visual representation of muscle activity in the heart. t is measured with a tool called the cardiograph. This device works by using sensors to monitor the heart’s electric activity. Because the heart pumps by itself it is called self-exciting. It doesn’t need external cues to continue to beat. Each pump cycles blood through it, pulling in blood from the body, pumping it through the lungs to oxygenate it, and then pumping it back into the body for that oxygen to be used be organs and muscles. Each of those pumps, or pulses, puts out a very small amount of electricity. That electricity can be sensed through the skin with sensitive electrodes. A cardiogram is the tracking of the highs and lows of electrical activity. Each person’s cardiogram looks just a little different. This cardiogram in rose gold plate will look great as a solo piece. The little offset heart hangs feely which will give the piece just a little bit of motion. The star of the piece, the cardiogram, is static hung. Laid flush against the skin, the rose gold will be a stunning addition to any outfit. This gift is fantastic for the lady in your life that loves science, medicine, and art. If your wife is in the medical field or veterinary field, know that you’ve just found the perfect anniversary gift for her. It is so reasonably priced, you’ll be able to take her to a nice dinner as well! The symbol for love is the heart. The symbol for forever is the infinity symbol. Combine them together and you have a piece to celebrate that you will love her forever. This necklace created by Angara is a clever and original pairing of the heart and infinity symbol. Plus it is an inspired combination of gold, diamonds and the exotic tanzanite stone. The infinity symbol resembles a sideways eight. It was first used by a seventeenth century mathematician called John Wallis. Although he did not explain the choice of the design of the symbol, he used it to mean many in his book De sectionibus conicis. Published in 1655 the symbol gained popularity slowly. The first person to use it meaning time or quantity without end was Swiss mathematician Leonard Euler. His version of the infinity symbol was more open, rather than a connected line and is no longer in use. Although we sort of love it and wouldn’t mind having a charm made out of it if we are being honest. Our necklace includes the infinity symbol turn on its side. Technically speaking there is no correct way for the symbol to be oriented but it may be confused with a figure eight when oriented in the vertical position. For this reason, most people use it on the horizontal. 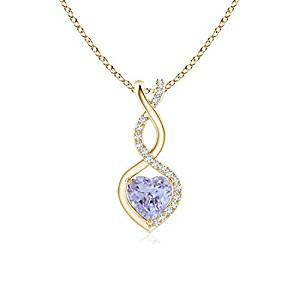 The bottom loop of the infinity cradles a gorgeous tanzanite stone, cut into the shape of a heart. Tanzanite is a newer discovery, having been unearthed in 1967. An explorer named Manuel de Souza found the only known source for the stone in Tanzania near Mount Kilimanjaro. In 1968 Tiffany & Co named the brilliant indigo blue, violet or burgundy stone tanzanite after its country of origin. The stone was so stunning that the American Gem Society even named tanzanite a birthstone for December. This was the first change made to their list of birthstones since 1912. Angara’s selection of tanzanite is jaw-dropping. The infinity loops around the indigo heart stone with a delicate, sweeping effect. At first glance, it almost appears as if the stone is floating. Add to all this the crest of round cut brilliant white diamonds crawling up the side of the 14k yellow gold infinity loop and you have a perfect wow-factor piece. It comes with an eighteen-inch chain which means it will hang just below the collarbone for most people. This necklace is absolutely a solo piece hung against the skin. We recommend pairing it with paler colors so the richness of the tanzanite really stands out. Your love for her is forever. Show her how much that means to you with this amazing piece and words will not be necessary. This simply wrought gold-plated necklace is darling. The heart is the only element in this piece and we do not think it needs any more than that. The peak of the heart continues into a sweeping spiral shape that is uniquely gorgeous. Constructed from a single rope of yellow gold-plated 925 sterling silver, the piece has a very raw feel in the metal working. This imbues it with a very rustic charm that we cannot get enough of. 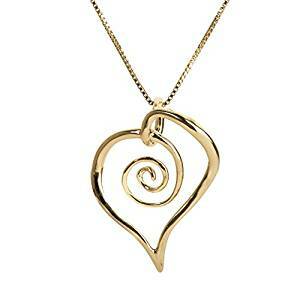 Most popular in Celtic symbology the spiral also appears in Mayan, Roman, Greek and Indian symbolic pieces. The spiral occurs in nature with surprising regularity. Most notably mollusk shells, like snails, and the curling tendrils of new plant shoots tend to appear in perfect spirals. These and other occurrences must have inspired artists all of the world to duplicate the swooping design. The spiral shape was so fantastic it even invaded the sciences. Thirteenth-century mathematician Leonardo Fibonacci figured out there is a mathematical equation in the outward-reaching spiral. Called the Fibonacci Sequence or the Golden Ratio, this equation traces the predictable arch of the spiral. Symbolically the spiral shape speaks to expansion, connection and development among other things. These ideas are crucial in maintaining a healthy relationship. In Celtic symbology, it is called a triskelion and often appears with three branches spiraling out from the center. It stands for the three “realms” – Land, Sea and Sky. We love this heart and spiral. This necklace comes with a perfect length eighteen-inch chain so it will come to just below the collarbone for most people. This is a perfect solo piece laid against the skin. Alternatively, you can move the charm to a longer chain for a low hanging necklace and it will work wonderfully in a layered creation. Not quite a statement piece but complex enough to make one anyway. Beautiful for its simplicity and meaningful for its symbolism, the ancient spiral is the perfect way to remind your loved one that you really and truly do love them. Even the phrase itself can have so many connotations. Parents say an unconditional I love you in words and actions. Family says I love you as both greeting and goodbyes. Friends will say I love you to celebrate a strong, rooted friendship. Partners, couples, and spouses use it to enforce and enhance their romance. We can love our pets, our people, our hobbies and ourselves and we will use the phrase I love you for all of them. This necklace is a gorgeous work of both sentiment and craftsmanship. 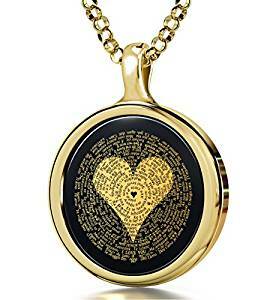 An onyx pendant wrapped in 24k yellow gold features a stylized heart and is inscribed with the phrase “I love you” in one hundred and twenty languages. The bright yellow gold plays majestically off the smooth, deep black onyx. NanoStyle, the creator of this genius pendant, includes a magnifying glass to survey all the various ways you can tell your gal you love her. Hung from an eighteen-inch chain, the lovely piece on love simply must be worn solo. The classic gold and black combo make it wearable with any outfit, any style, and any occasion. It will look just as darling paired with jeans and blouse as it would perch over the stunning neckline of an evening gown. It is a statement piece with a subtle flair. Even the rolo style chain adds a rare touch. Constructed of chunky round links as opposed to the small ovals of a standard chain, it complements the round pendant superbly. And what a statement it makes. You cannot go wrong giving this as an anniversary gift. The pendant itself literally says everything you need it to say in one hundred and twenty ways. Perhaps the most classic presentation of any heart necklace is the locket. Naturally, our list could not be complete without a locket. We chose carefully because not just any old locket will do. It will not do for our collection and we know it needs to be the perfect one for yours as well. 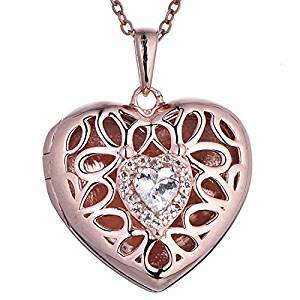 This rose gold plated locket is our perfect pick. The front door of the locket is filigree metal work so even when it is closed, your loved one will peek out from inside. The center is adorned with round cut white topaz. White topaz is a natural stone with a diamond-esque appearance. It offers all the glitter and glitz of a girl’s best friend without the wallet’s greatest enemy level price tag. Made by With You, the company has a special passion for lockets. They believe there is nothing more special than being able to carry your loved one with you. Most importantly, they want you to be able to carry them close to your heart. The creator gives her touching story of creating a locket after losing her father to brain cancer. When it came time for her sister, and later her to get married, the founder of With You placed that locket with their father’s picture on an anklet. This meant that in some small way they were still able to walk with their father down the aisle. She took that skill and sentiment and has created a lovely locket for you to present your loved one with this anniversary. They will even print and place the picture for you! It comes on your choice of chain length so it can be worn however you like! A locket is a classic statement of love and affection and we believe this is the perfect one to gift! There is no rule in design that says a simple is bad. Sometimes the simplest things do the best work. We believe this floating heart pendant necklace is a prime example of this. Some of the most famous works of art are incredibly simple yet remarkably complex. Jackson Pollack pieces on the surface are chaotic splatters of paint on canvas, yet people find they cannot look away. In 2013 a simple blue canvas with a single white stripe down the center fetched an alarmingly 43.8 million dollars at a Sotheby’s auction. Simple and straight forward can be downright dramatic when the conditions are right. The next necklace on our list is pretty straight forward. 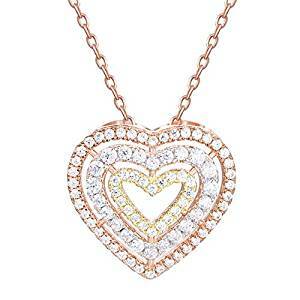 It features a brightly polished 14k yellow gold heart hanging from a seventeen-inch box chain. Rather than use a hook fixture or a bale, the chain feeds through the pendant. This way the heart seems to simply float on the chain. Despite its simplicity, we recommend this be worn as a solo piece. It will hang just above the collarbone for most people. The shorter chain will make it difficult to wear over clothing or under collars And while this makes a fantastic anniversary gift, the simplicity, size, and design of this Amazon Collection means that it is a perfect gift for a child or young lady. This would be a wonderful present for a First Communion, Grade Graduation or Birthday. If you really want to win the gift-giving game, present one to your daughter and one to her mother. Two happy ladies in your life and you can’t go wrong! Love takes two people and brings them together. It wraps them up into each other’s lives, thoughts, and habits. This necklace celebrates the connectedness of two lovers in two ways. The shape of the pendant and the dual stones within. The pendant almost reminds us of two swans craning their heads together. Swans, like hearts, are typically associated with love. Swans are one of the bird species that mate for life. Once they choose a partner they stay with him or her for the rest of their lives. They live, play, and nest together. This makes them a perfect representation of love. Scientists have even figured out that if a partner dies, the remaining swan may actually grieve so deeply it fails to eat or groom appropriately and may die itself. Essentially swans can, in fact, die of a broken heart. While that is sad it is also particularly heartwarming that birds can love just as deeply as anything else. So the imagery evoked by this swirling pendant is wonderfully appropriate. 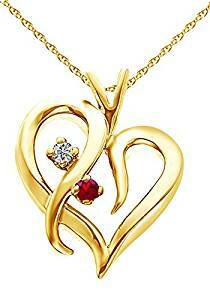 Available in your choice of 14k gold colors, yellow, white, or rose one arm of the heart is adorned with a coordinated pair of diamond and ruby. We love that the makers, AFFY, elected to use two different stones instead of a matched set. Love involves two people and the relationship, if it is a good match, does not make them less an individual. In the best relationships, the love they share enhances them both. Much like the pale pink diamond enhances the deep red ruby. The 18 millimeters by 14 millimeters pendant is hung from an eighteen-inch chain. As with others on our list, this one is simply too beautiful to share the spotlight with other necklaces. It is best worn against the skin. For a boost of style points, wear it with a sweetheart neckline. The curves of the collar with mimic the graceful scroll of the charm. Your sweetie with love it! The next piece on our list is produced by Gem Stone King and features a wonderful application of two of our favorite colors of gold. This 14k gold-plated charm includes elements of both white and rose gold. The colors of gold are created by carefully blending a series of elements. One hundred percent real gold is labeled 24k and comes in a warm yellow color. Anything lower than 24k gold is still gold but it has been combined with some percentage of copper and or silver to achieve a different look. This does not come at the cost of beauty for us. But we love learning how our favorite pieces of jewelry came to be. This necklace features 14k white gold and 14k rose gold. 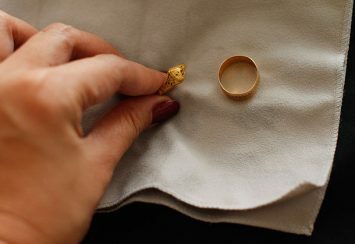 In order for gold to be considered fourteen karats and bear the 14k, 14kt, or 525 stamp, it must be at least 51.5% true gold and not more than 48.5% other metals or alloys. White gold combines gold (chemical symbol Au) with silver (Ag). The brighter the “whiteness” of the gold, the more silver it contains. But again in order to receive the 14k mark, it cannot be more than 48.5% silver. Rose gold is a mix of gold (Au) and copper (Cu). The rosier the color, the higher the concentration of the copper. Yellow gold, despite the popularity of the other colors, still remains the most popular. In the United States, it is illegal to sell anything less than 10k as gold. On top of the two colors of gold, this necklace includes a round cut sky blue aquamarine and a row of glittering cubic zirconia. From a distance, the color of the aquamarine is almost illusory. It could look like a diamond at a glance. Close up though you will start to notice the beautiful hint of blue that plays nicely of the rose and white golds. This piece will look stunning with a white or blue ensemble. The blue will really be enhanced if it is worn with a bold blue sweater or blouse. Honestly, we liked the last piece so much we made it our mission to discover the only thing that could be better than two types of gold; three types of gold with a heaping helping of cubic zirconia. The interesting layout of the piece sets three hearts nested together like a Russian Matryoshka doll. The trendy rose gold is the first layer, followed by the modern white gold for the second heart. The final heart is just a pop of the classic yellow gold. Each heart simply drips with cubic zirconia stones, eighty-four of them to be exact. Created by jewelers Guqi Guli, the pendant is sterling silver plated with 14k rose, white, and yellow gold. It combines the classic styling of the jewel-studded heart with a more modern twist of incorporating all three popular colors of gold. It includes a sixteen-inch chain with a two-inch extender so the length is just perfect to wear as a solo piece for just about anyone’s preference. 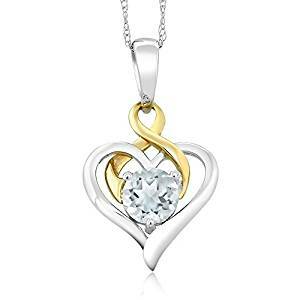 Since the pendant includes all three colors of gold and bright white cubic zirconia stones it will wear nicely with just about any color. It can even hold its own with subtle patterns, though it might be lost with bolder prints.